In the fall of 1780, John Paulding of New York State went to pay a visit to his sweetheart Sarah Teed. Paulding stood at over six feet tall and while today this would hardly guarantee him a spot in the NBA, for the era, he was impressively large. Perhaps it was for this reason that Sarah’s brother decided to surround his sister’s beau (I’m guessing he didn’t approve of the relationship) with the help of several armed friends. Of course it could also have been because Paulding was a known Patriot and American militiaman while Sarah’s brother was an active Loyalist. Not surprisingly, Paulding didn’t take kindly to the threatening nature of the encounter and opened fire on the Loyalists, injuring several before he was captured. Most of the attackers wanted to kill him on the spot, but Ensign Teed convinced them to spare the young man’s life, proving, I think, that a sister’s wrath is far more dangerous than a few gunshot wounds. 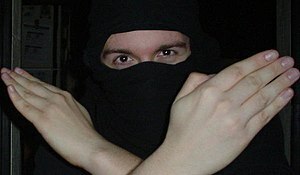 So instead, Paulding’s captors took him to the makeshift “Sugar House” prison set up by the British in New York City where he spent one night before escaping by jumping from a window in broad daylight, because (and again I’m just guessing here) he was also a ninja. His next stop was the nearby livery stable where he scrounged up a green coat, of the type commonly worn by the German soldiers hired by the British to fight in much of the Revolutionary War. Once disguised, he made his way fairly easily back toward home, where a few days later it was business as usual (though I suspect he avoided the Teed household for a while) as he headed out on patrol with a couple of militia buddies, now wearing his new green coat. 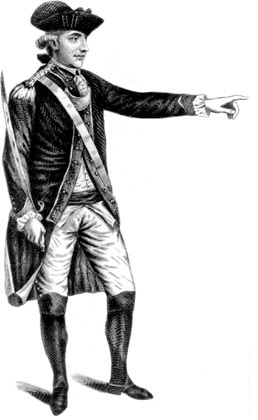 The next part of Paulding’s story may be more familiar to those of you who are American Revolutionary history buffs because while on patrol, Paulding and his buddies (Isaac Van Wart and David Williams) came upon the British spy Major John André who was famously hanged for his collaboration with the American traitor Benedict Arnold. Relieved to see that one of the armed men he met was wearing a familiar, and usually friendly, coat, André began to feel out the men’s loyalties. Unfortunately for him, Paulding was as clever as he was tall and under his leadership, the three militiamen soon took the spy into custody, reportedly refusing an extravagant bribe. For their efforts, the three men were eventually awarded the first ever Fidelity Medallions upon the personal recommendation of George Washington. I tell you this story because some suggest that it is the oldest example of a military award being bestowed upon men of common birth. In other words, it was the first time anyone had bothered to recognize the little guy. Now, I can’t prove that’s true, and I kind of hope it isn’t. I’d like to think that people long before 1780 were willing to give a nod to their fellows, but then there is some truth, even well beyond the scope of the military, to the idea that often accolades go to recipients who don’t really benefit much from them while the little guy who could use a pat on the back, often goes unnoticed. Nowhere near as prestigious as the Fidelity Medallion, but pretty great anyway. So with that in mind, I am extremely honored to have the opportunity to pass on a wonderful blog award that was recently given to me. 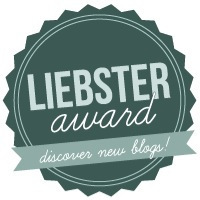 The Liebster Award recognizes blogs that don’t yet have a whole lot of followers (fewer than 200). In fact, I am truly amazed to say that I no longer fit the requirements for the award. Just about a week ago the editors at Wordpress chose my recent post about the taxation of beards by Russia’s Peter the Great to be featured on Freshly Pressed. The response has been overwhelming. In one week, more than 150 new readers decided to follow my silly little history blog. Wow! And there are more new people who have dropped in to “like” or comment upon posts I have written. I would like to say a big thank you to all of you who are new to my little corner of the blogosphere. Before you arrived, I had been writing for a pretty small audience about moments in history, my life, and the point at which the two occasionally connect, no matter how far I have to stretch it. Since my posts do require a fair bit of research to put together, there have been times when I’ve been discouraged that there aren’t more people reading. And I know there are other bloggers out there just getting going and sometimes feeling a little frustrated that there aren’t many people reading. That’s why I am accepting the Liebster award, so that I can give a nod to other little guys out there. Thank you very much to Rachel Malburg whose blog Simple.Fun.Raw could soon become my new favorite food blog. She had me at brownie bites. I guess the most honest answer is that like so many of us blogging types, I am a writer, who wishes to someday be a bestselling author, or, at least to have someone maybe read my books and kind of like them. I guess, then, you could say I am in pursuit of the almighty platform. But beyond that, I always thought newspaper columnists like Dave Barry had the very best job in the world and with the death of print media, came the rise of the blog. So here I am. Think Leave it to Beaver. More or less. IS THIS WHERE YOU THOUGHT YOU’D BE AT THIS AGE? I’ve made a lot of plans in my life. Some have worked out. Some haven’t. But I can definitely say I am very happy with where I am right now. The California Redwoods. It’s like hiking through a fairy tale. There are simply too many places I’d like to go to answer that question. For right now, I’m working to complete the goal of reaching all 50 US states by age 50. A home in Oregon just before the bottom fell out of the housing market. Sometimes adventure is expensive. I’m kind of a crazy fish lady. The Princess Bride. 26 years later, nothing has yet been able to top it. SO WHAT EVER HAPPENED TO JOHN PAULDING? Okay, it’s possible that this was not the question actually put forward by Rachel, but it really isn’t fair to ask a writer to name her favorite book. And since you asked, he lived the life of a hero, died of natural causes, and now has many streets, parks, and elementary schools named after him. He also married Sarah Teed. I doubt her brother was invited to the wedding. The Nominations: These are a few blogs that have piqued my interest, but that don’t have a huge following yet. Some are pretty new and are probably still working to find their voice, but worth watching, I think. A few have been around for a while and are just looking for their audience. Perhaps they will pique your interest, too. As for questions to the nominees, um, same questions, I guess? Except maybe that last one. For that, you get a freebie. Thanks! I really appreciate it. And love your blog. Great topics and writing. Perhaps the best link between a historical anecdote and a contemporary story that I’ve ever seen, and I don’t just dish out that praise every day (or ever before come to mention it!). Thank you very much for the nomination, my inner egotist is already looking on it like an Oscar. That is the most gracious Oscar speech ever. Thanks! Maybe if I reach my goal early, I should add Canadian Provinces. I’ve only been to one. I guess since I’d be coming to it late, I’d have to include Nunavut. Maybe it can be reached by dogsled? Thank you so much for the nomination. I feel very honored. Your posts are great. My high school history teacher could take a few lessons from you on how to make history interesting. Thank you. Some might say that just shows that I am just really stubborn and unyielding when it comes to sticking to my formula, but, well, I guess I am a little stubborn. Your blog was great. The award flattered me. I also went to the redwoods so I understand. Big toothpicks for Paul Bunyan. As for the history lesson loved it. Thanks! I am enjoying getting to know your blog as well. I love history, doesn’t matter the country or time period. Great post. Glad to see you get the award. Thank you! I tend to skip around a lot around history and the world. Every culture and era has it’s little tidbit stories to offer up.